Today: social service siting, Mason Court, wild animals, Catholic ninjas. Thanksgiving is one day when America not only makes a point of feeding the hungry, but feeding them in style. There was a big crowd at St. John’s Free Meal for Thanksgiving Breakfast. Lots of hugs and smiles. The breakfast conversation was sparkling, as always. Mike: Why are they showing “Night of the Living Dead” on Thanksgiving? Bruce: The dead gotta eat too, Mike! 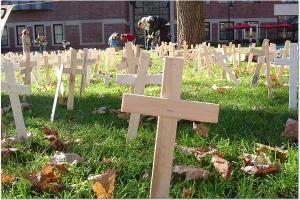 Clark University students yesterday installed 2,000 crosses and other faith symbols on the main quad to remember the 2,082 GIs who lost their lives in Iraq and to call for a swift withdrawal of U.S. forces. Photo: Emma Klein. More at Worcester Indymedia. Here’s an interesting article on Slate about the declining popularity of the Sacrament of Reconciliation. Reusable bag titan Rajiv Badlani points out that because you can’t convince every shopper to use cloth shopping bags, there will always be some plastic bags out there. He plans to recycle these into textiles. You can do something similar at home, with shopping bags or the plastic bags they put your newspaper in on rainy days. All you have to do is cut the bags into ribbons, twist the ribbons into a sort of yarn, and then knit or crochet the yarn into whatever you like. This is an inexpensive way to make holiday gifts for the environmentalists on your list. Pie and Coffee contributor and cinemaster Adam Villani started a personal blog last week. The next day he was namechecked by Boing Boing. Auspicious. Father Basil Pennington was a Trappist monk who died in June at St Joseph’s Abbey in Spencer. Many know of him because of his work with the centering prayer movement, revitalizing the contemplative tradition among Catholics in America. Tom Lewis happened to go to mass at the Abbey the morning after Fr Pennington had died, and saw him lying in state. Mike: So his body was there in the chapel? Tom: He had enormous feet. Dom Basil was in many ways a giant of a man. Even physically, he looked like someone who stepped out of the Old Testament with his huge frame and long beard. He was also interiorly a giant in the sense of one of those rare people who is filled with many, many, many ideas. Big ideas. I stopped by the monastery last week to pick up a donation of food for some shelters and soup kitchens in Worcester, and they also gave me several boxes with Fr Pennington’s clothes. It was like being handed a crate of holy relics. After sorting through it, a lot of the clothes went right to the thrift shop—there aren’t many homeless people in Worcester who are that big. His suits were size 50L. Update: The South Bend Catholic Worker has a good chance of winning its zoning battle. The article cited below says that they “lost” yesterday’s zoning vote because it was a tie vote. But all this really means is that it will go to another vote at the next Common Council meeting, when the missing councilor will be there and break the tie. When I was in SB a couple weeks ago, the feeling was that few people in power were willing to support the CW. So this tie vote represents powerful momentum. One hopes that they can work something out with those neighbors who oppose the zoning change, and get a 9-0 council vote on the compromise solution. A public hearing was held on whether to re-zone a Catholic group home and took nearly four hours Monday night. Ultimately, it was defeated due to a tie vote. A tie vote is much better than people were expecting. You are currently browsing the Pie and Coffee weblog archives for the year 2005.